At the time of the publication, the CAD traded at 75.86 US¢/CAD, the lowest level since July. The Canadian economy has struggled on the heels of record low oil prices and the country is currently experiencing a current account deficit. National notes that the positive economic news, such as the USCMA trade deal and Bank of Canada’s (“BoC”) hawkish signals failed to offset risk of U.S. protectionism and weak oil prices. However, National highlighted that it expects improvements on both of those fronts. BMO highlighted that the CAD has yet to respond to the October rate hike in which BoC improved the CAD-US interest rate spread by 25 basis points. To that, CIBC believes that now the BoC has room to make two more interest rate hikes without much risk of having the Loonie appreciate excessively. As highlighted by RBC, the U.S. economy continues to lead the G7 with annualized US GDP growth of 4.2% in Q2 and 3.5% in Q3. National is not optimistic about the Fed’s 2019 growth as the pace of the country’s monetary policy tightening may fuel further USD appreciation, decreasing the competitiveness of American exporters. CIBC is forecasting the end of US dollar strength due to a pause in Fed hikes, and a potential ease in 2019 as fiscal restraint hits. Overall, the surveyed banks are forecasting the pair to trade between 75.0 and 82.0 US¢/CAD by the end of 2019. On November 16, the President of the European Central Bank (“ECB”), Mario Draghi, spoke on the Eurozone’s economic outlook. Draghi highlighted that growth slowdown was mainly due to a combination of temporary factors such as weather, sickness and industrial action and larger items such as weaker trade growth. Other aspects highlighted by the ECB include interest rates remaining at present levels until September 2019 and net asset purchases will come to an end in December. BMO notes that the Eurozone’s Q3 GDP growth came in at a 0.2% pace, the slowest in four years. RBC reported that the ECB monetary policy is not on a pre-set course and the ECB will have options if the uncertainty regarding the economy continues. National believes that the Euro has the potential to bounce back over the next year with the start of the ECB normalization policy and the end of the Fed tightening. CIBC shared National’s view, adding that the situation in Italy should continue to drag on for few months as the EU Commission is expected to find Italy’s budget non-compliant, leading to a few months of negotiating, infighting, and headlines; all of which will adversely affect the EUR. Overall, the surveyed banks remain divergent as to the future of the currency pair, forecasting it to trade anywhere between 61.0 and 67.6 EUR¢/CAD through the end of 2019. As highlighted in last month’s publication, the BoC raised its key monetary policy interest rate to 1.75% in late October. The hawkish language in the policy statement came with the removal of “gradual” rate hikes and that a more neutral state is to be warranted in achieving the inflation target. Pursuant to the hike, many of the surveyed banks are not expecting any more hikes in 2018. 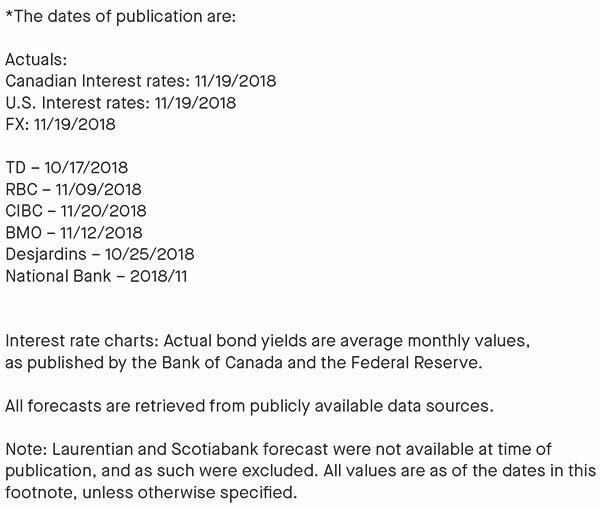 However, with respect to the 2019 outlook, National and BMO have indicated three additional rate hikes occurring in January, April and July are to be expected, whereas RBC expects only two. On November 8, the Federal Open Market Committee (“FOMC”) left its policy rate unchanged. BMO noted that the FOMC plans to continue with the quarterly rate hike schedule, with a final hike in December. RBC highlighted that the Fed is showing little inclination to deviate from the quarterly hikes and this will continue into 2019. Most of the surveyed banks are expecting three rate hikes in 2019, apart from CIBC calling for only two hikes in 2019. Overall the consensus amongst the surveyed banks is a rate hike for December to close off the year. 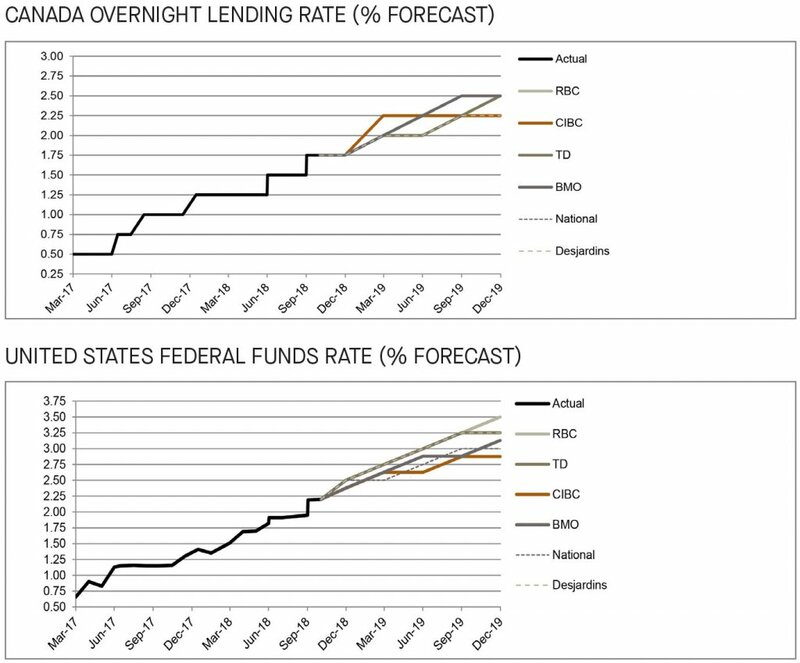 Since last month’s publication, the surveyed banks made minor upwards adjustments to the 2-year government bond yield forecasts in both Canada and the US. 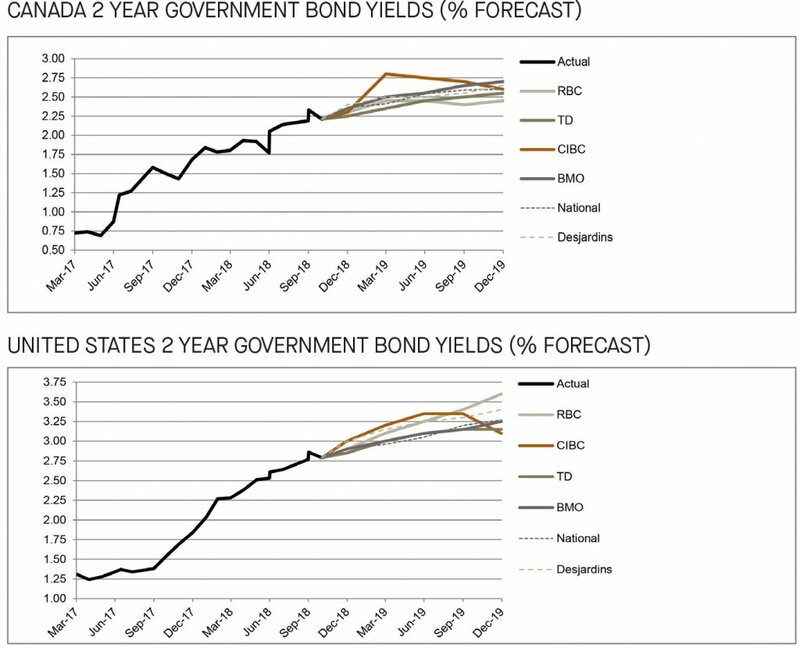 As at the date of the publication, the 2-year government bond yielded 2.2% and 2.8% in Canada and the US respectively. Overall, the reporting banks are in consensus that 2-year government bond yields shall steadily rise over the forecast horizon in both Canada and the US. Compared to last month’s publication, forecasts for the 10-year government bond yields were upwardly adjusted in Canada and the US by a majority of the surveyed banks. In both Canada and the US, National expects bond yields to continue their upward trend, citing the prospects of firmer inflation numbers and further policy tightening. However, BMO made downward adjustments to its 10-year Canadian bond yield forecast citing that the risk of persistent inversion will mount. Overall, the banks are in consensus as to the upward trend of the 10-year government bond yields, expecting them to yield between 2.4% and 2.9% in Canada and 2.9% to 3.3% in the US by the end of 2019. 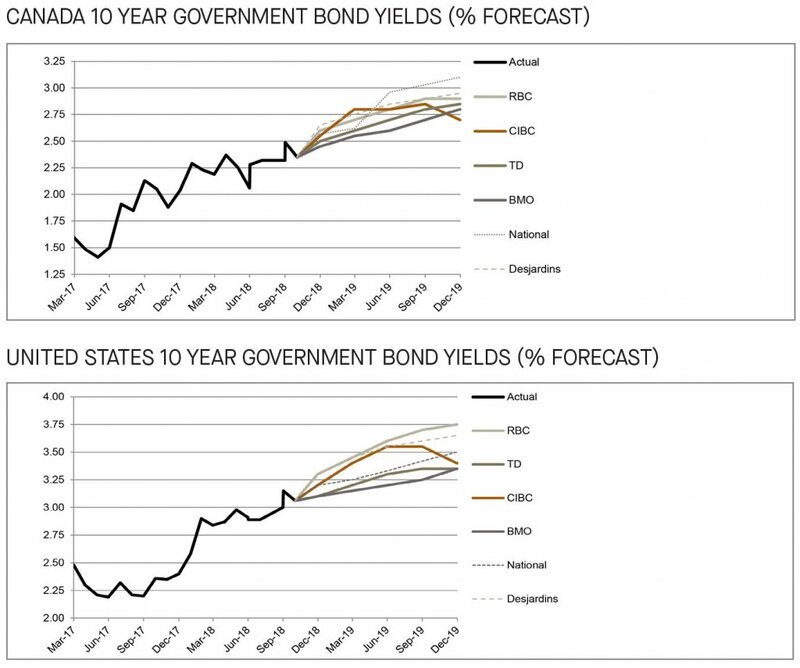 Since last month’s publication, the US long term government bond yield forecasts were revised upwardly, whereas the Canadian long-term bond yields experienced minor downward adjustments by most of the surveyed banks with the exception of National. 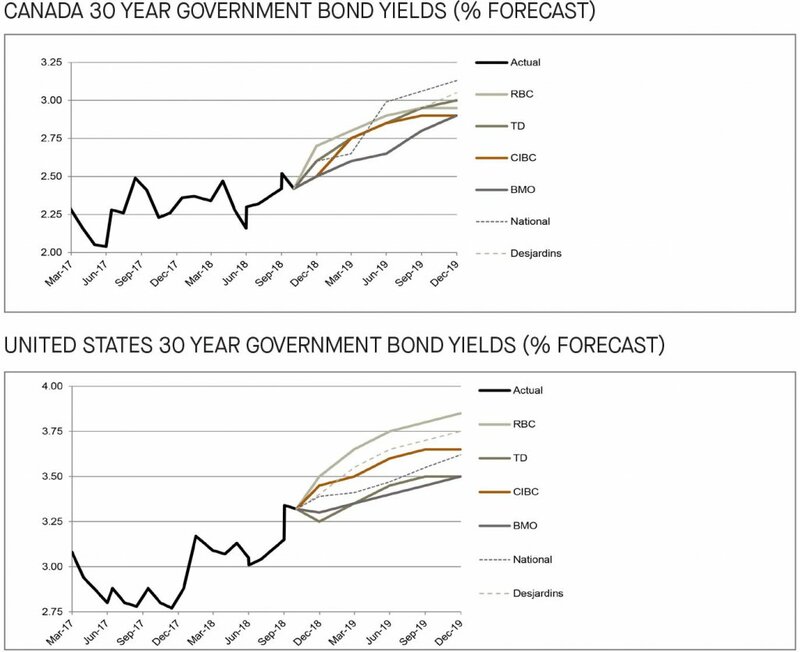 National is on the high end of the Canadian forecast, whilst RBC remains on the high end of the US forecast, expecting long term bonds to yield 3.1% and 3.9%, respectively, by end of 2019.